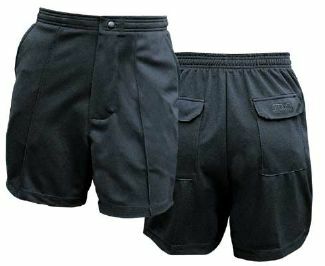 The all black Pro Classic Short features the highest quality, soft touch, 100% polyester fabric for lasting color fast value and durability! Proven to achieve respect and success on the field. Features: two back pockets,elastic waistband with inner drawstring, two side slash pockets and front crease for a professional look, back pockets have hook & loop closure flaps. Sizes S, M, L, XL, XXL. For XXL add $1.00.